November 2017 - Don Mills Builder, Inc. November 2017 - Don Mills Builder, Inc.
Planning to build a new home in 2018? Custom home building in Summerville, NC, is at an all-time high. More homebuyers are throwing in the towel on house hunting and opting for custom homes. What’s not to love about a brand new home that is designed and built to your very own specifications? No need to compromise on a home. You can have whatever your heart desires. Before you start planning with your builder, gain some inspiration with these up and coming home building trends for 2018. Aging-in-place accommodations. More seniors are choosing to stay in their homes as they age. Taking this into consideration when designing your home allows you to be prepared for the future and avoid having to make changes later. Wider doorways, wheelchair-friendly bathrooms, and even elevators are being installed in new homes proactively. Multi-generational planning. In many cases multiple generations are living under one roof from aging parents to grandchildren. It’s wise to plan ahead for the fact that family members of all ages may one day be under your roof. Roof decks. This urban feature is suddenly popping up in residential areas as homeowners search for new ways to enjoy the outdoors in style (and with a view). Light toned floors. Style is turning away from dark wood floors and moving toward lighter tones, even white in some homes. Bold walls. To offset the pale floors you’ll see an increase in dark paint colors on walls, including black for those who aren’t afraid to be a little edgy. Large patterns are also making a comeback on walls and accessories. Simplistic kitchen features. Cabinetry used to be the focal point of every kitchen. In 2018 you can expect to see more open shelving that allows you to showcase your collectibles and store bulkier items. Metallic decor. Shiny brass accents are coming back into style for their attention-drawing properties. Natural bathrooms. A turn toward green and rustic features will be seen in bathrooms this year from natural wood accents to claw-foot tubs. Reused/Recycled furniture. Common items, old pallets, and more can be turned into furniture, and this concept is as trendy as it is environmentally friendly. Live plants. Actual greenery is being used in décor much more as of late and will be seen even more in the upcoming year. On-demand water heaters. These heat water as it comes into your home so that you never run out of hot water. They also save a significant amount of energy because they don’t heat (and keep heating) a tank full of water you may never use. Programmable lighting. Also known as smart lighting, this energy-saving convenience allows you to easily control all of the lights in your home from one place and to program your lights to turn on and off at certain times of the day whether you are at home or away. Keep an eye out for these trends in custom home building in Summerfield, NC, in the upcoming year. If you’re planning to build or even thinking about it, keep these ideas in mind and contact Don Mills Builders to set up a consultation: (336)362-1777. Are you looking for a place to settle down, a community that’s great for kids and families? Oak Ridge, NC, is gaining popularity as families are looking for a small town with great opportunity. Convenient to Greensboro and High Point with Winston Salem close by, there is always something to do and see. A quieter place with a countryside feel that’s just a few minutes’ drive from multiple cities, you’ll soon see why people are choosing to move to the area. And there are homes for sale in Oak Ridge, NC, now. Areavibes.com evaluates towns and cities based on a variety of criteria from crime rate to cost of living. Oak Ridge received an 84, which means it is “exceptionally livable” when compared to other places in North Carolina. That score ranks Oak Ridge third in the entire state of NC and 124th in the US. Low crime rate, high graduation rate, and high income per capita are just a few of the positive qualities that contributed to the score. People living in Oak Ridge are educated and successful. Even the weather is nice compared to many other areas in the state and the nation. Amenities also contribute to the rank a town receives, and Oak Ridge has plenty of grocery stores, restaurants, coffee shops, shopping centers, schools, parks, and fitness centers in the vicinity. These are the everyday conveniences that make life easier and more fulfilling. Beyond the town itself, there are more opportunities for shopping, dining, and entertainment in the nearby cities of Greensboro, High Point, and Winston Salem. When it comes to raising a family, schools are important. There is one public school and one private school in Oak Ridge, boasting higher than average test scores for the state. Public schools students would attend Oak Ridge Elementary, Northwest Middle, and Northwest High School. The Oak Ridge Military Academy is a private school that’s been in operation since 1852, preparing youth for success in military and civilian endeavors. Other private and charter school options can be found in Greensboro, Winston Salem, High Point, and Kernersville. Visit Oak Ridge to see firsthand just why it is becoming one of the best places to raise a family. 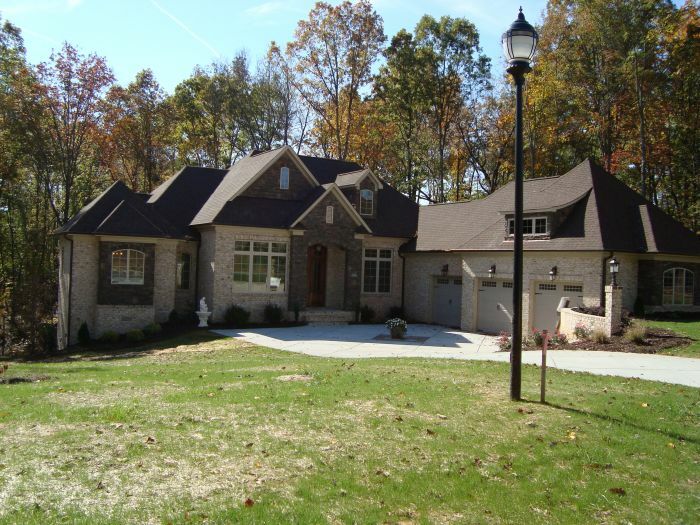 If you’re looking for a new home for sale in Oak Ridge, NC, consider a Don Mills signature home. Don Mills builds luxurious custom homes in the most popular neighborhoods in Oak Ridge, including Birkhaven, Linville Ridge, and Knight’s Landing. If you want a unique home that is designed just for you with all the features you can’t seem to find anywhere else, Don Mills Builders can make it happen. Search ready to build home sites now or contact Don to get started designing and building your dream home in a dream location. Call (336) 362-1777.